This Website offers various software downloads for Windows Users. Here you can download software to turn off monitor of a desktop or laptop computer running windows (XP, Vista, Windows 7, Windows 8, etc). You can also download a simple and easy to use Alarm Clock and in case you would like to display clock on your desktop at desired position with desired font, do have a look at the Desktop Clock. You can even configure the Desktop Clock to display date and time of any country in the world by adjusting the time difference between your country and other country. There are many more software downloads available on this website on a free to try basis such as Auto Shutdown Softwares providing tons of features for controlling computer shutdown. Do have a look by scrolling to know more about the various windows software downloads. Software Downloads to Shutdown Computer Automatically, in a scheduled way, and more at Shutdown site, software listing by shutdown feature supported. 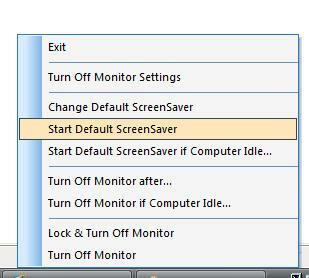 Turn Off Monitor :- Turn Off Monitor is a small utility which allows to Turn Monitor Off or Start ScreenSaver whenever you want or after n minutes or after computer remains idle for n minutes. Turning Monitor Off / Display is different than running a blank screensaver and saves electricity. You can define a shortcut key (e.g. any unused key e.g. Ctrl+R , F11 etc) or use a Desktop icon or use icon in System Tray to Turn Monitor Off / Display. To Turn Monitor On / Display just move mouse a little or press some key on keyboard.Can be useful to Turn Laptop Monitor Off as well. Can be helpful to diagnose if screensaver not working. Can be an alternative to Power Management if screensaver not working as expected. The Turn Off Monitor Software has been tested on Windows XP, Windows Vista and will be tested on Windows 7. Eject CD or Eject Optical Drive using desktop shortcut. The Utility can be handy to turn monitor off when listening to music on computer, during music download, or big file download or at any other time when you need computer / laptop to be running and you do not need the monitor to remain turned on. Now you can Lock Computer manually or whenever computer is locked automatically, and the software download will turn off monitor automatically. Ways to Switch Monitor Off provided by the Turn Off Monitor Utility. More Features of Turn Off Monitor Utility. Download free to try Turn Off Monitor Utility. The Turn Off Monitor Software can be used to turn off all the monitors connected to your Windows computer. With a slight mouse cursor movement or a keypress on keyboard, all the monitors will wake up. In case you do have only two monitors connected to your computer, you can also try out Dual Monitor Software which will allow you to turn off individual monitor and turn on individual monitor using shortcuts, shortcut key combination. The Software has other tons of features which can be really handy and easy to use with a dual or multiple monitor computer. Monitor Changes in your Screen by monitoring color of a specific pixel with the Screen Monitor Software. The Software can be configured to play and audio or video file whenever changes in screen are detected. The Screen Monitor Software can be used whenever you need to monitor your computer screen of changes such as a message alert, a chat window or even new task in your worklist window. Alarm Clock Utility can be used to setup alert / alarm at defined date/time. Alarm Clock can alert by playing .wav file or speaking out text and displaying an alarm screen to stop / snooze alarm. 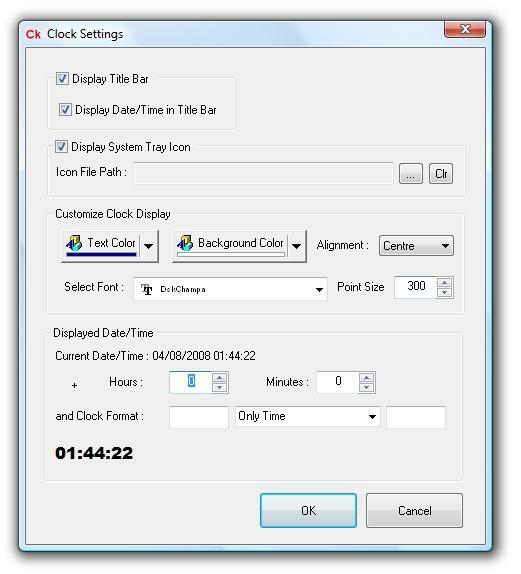 Clock Utility allows to Display a Configurable Clock on Desktop. The Desktop Clock can be easily emulated to display world time. Desktop Clock's Display Font, Color, Location etc can be changed easily. Download Trial Version of Clock Utility Now. Register for only $5.00 and get world time on your desktop now and all upgrades come for free. There are no nagging pop-ups in trial version of Clock. Control Shutdown and other computer control actions with Easy ShutDown Software Download. The Software Download allows to Auto Shutdown, Power Off, Auto Restart, Auto Hibernate, Send Computer in StandBy mode automatically, Toggle the button Use Proxy in Internet Explorer, Disconnect internet by hanging up Modem, Log Off Signed On User, and much more. Define Keyboard Shortcut / Hot Key, Create Desktop Shortcut to control your computer easily. Schedule Computer Control Actions by defining duration or time. Trial Version is fully functional with no nagging reminders. Download fully functional and free to try Software Utility. You can Register the Software Utility for only $5.00 today and future updates come at no extra cost. 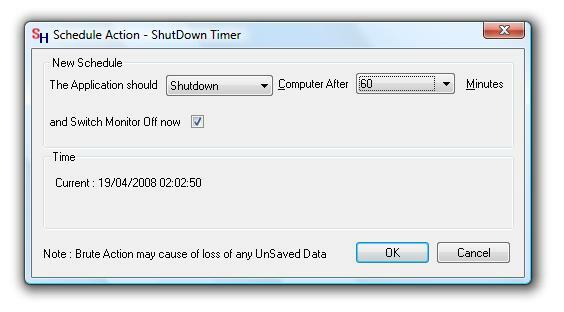 Use ShutDown Timer to ShutDown Computer after defined number of minutes. Other Computer Control Operations are also supported such as Restart Computer etc. Register Shutdown Timer Software Download for only $5.00 and upgrades to the utility come at no extra cost. Works on Windows XP, Vista and Other Windows Operating Systems including Windows 8, Windows 7, Windows Vista, Windows 2000, etc. There are no reminders in Trial version of Shutdown Timer. Trial Version allows to use the application upto a maximum of 15 times. Shutdown Software Utilities grouped by shutdown actions they can perform. Let's say you are looking for creating a shutdown shortcut, the link at the beginning of this sentence will display a software utility that can create a shutdown shortcut. The link will also display other shutdown related actions to choose from, such as auto shutdown, create shutdown command, etc. Lock Mouse with Mouse Lock Software Utility, can be useful when you want to clean mouse or want to avoid any accidental mouse movement. Unlock Mouse Cursor by closing the utility. Download and try Mouse Lock Software Utility for free. Block Website Utility allows to Block websites by adding / editing entries to / of windows hosts file. The Utility allows to Backup, Restore, View windows hosts file. Download and try Block Website Utility Now. Trial Version of Block Website Utility is fully functional and does present you unwanted reminders. Register Block Website Utility now using Credit/Debit Card (using PayPal) or PayPal Account for $5.00 and future updates to the software utility comes to you at no extra cost. Use Keyboard Shortcut Utility to open existing documents / programs with configurable keyboard shortcuts / hot keys. The Software download Keyboard Shortcut has simple interface to allow the program / document selection. You can also define program arguments to be passed when keyboard shortcut is pressed. Download Keyboard Shortcut Utility Now. Monitor On Software Utility can Turn Monitor On when a popup window with defined title appears on the screen. Window title to be monitored can be defined exactly or partially. Register Monitor On Software Utility for $5.00 only. Start ScreenSaver Utility to Start Default Screen Saver using Desktop Shortcut, Change Default Screen Saver easily and configure or preview Screen Saver easily. Setup creates Shortcut to Launch Screen Saver Properties easily. Download Trial Version of Start ScreenSaver Utility Now. Desktop Right Click Menu Manager Utility to add menu items of your own language to desktop right click menu easily. Delete Desktop Right Click Menu Items easily. The Desktop Right Click Menu Manager as of now is supported only on Windows Vista Operating System. 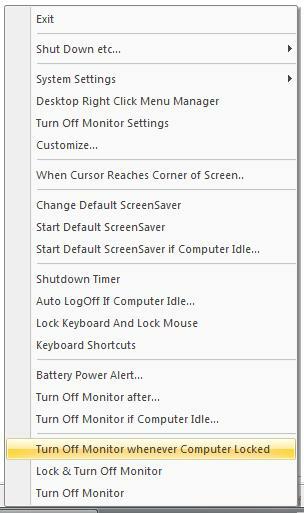 The Desktop Right Click Menu Manager is an integral part of Turn Off Monitor Utility as well. Download Free Trial of Desktop Right Click Menu Manager Now. Mouse Click Software Download to automate clicking of mouse (left button, right button, single or double click) at defined location on computer screen using a keyboard shortcut. The Software Download Mouse Click will move mouse to the defined location and will click/double click one time when the defined keyboard shortcut is pressed one time. Download Free Trial of Mouse Click Software Now. Another Mouse Automation software named Auto Clicker can help you keep on clicking on a mouse cursor location until stopped. The Mouse Clicking can be started with the press of a configurable shortcut key and can be stopped by pressing the same shortcut key. Auto LogOff signed on user, if user leaves computer idle for defined number of minutes. More features will be added to auto log off functionality to save energy and make the use of software really easy. Download trial version (Auto LogOff Software utility is included in Turn Off Monitor utility, download Turn Off Monitor Utility from link above or follow the Auto LogOff link) and use auto logoff software utility to auto logoff , signed on user automatically, if user leaves pc idle. Easy to Use and Yet Sophisticate Duplicate File Finder Software for Windows 8, Windows 7, Windows 2000, Windows Vista, and for Windows XP. This Duplicate File Finder Software can be used to find Duplicate Image Files, Duplicate Song Files, Duplicate Video Files or any other type of files which are occupying space on your hard disk. Using this Duplicate File Finder Software you can visually explore your Hard Disk and know which files are occupying space on your Hard Disk. You can even use this Duplicate File Finder as a File Locator or even as a Hard Disk Analyser Software. Computer(s) use good amount of energy, allow Computer(s) to Save Energy as well. Turn Off Monitor also supports Text to Speech conversion. Software Utilities, Screen Savers, Mouse Utilities (Mouse Click and Auto Mouse Click), and more. Contact Us regarding Turn Off Monitor Utility or about any other Software Utility or connect with sales team. Computer Utilities Combo includes Turn Off Monitor Utility, Desktop Clock Utility, Shutdown Timer, Easy Shutdown Utility, Power Off, auto power off, Block Website Utility, Easy Hide Window Utility, Monitor On, Mouse Lock Utility, Alarm Clock. etc. The Utilities Combo will cost you only $10 and will give you lots of useful software utilities for your Windows Computer.